Sometimes when people hear a woman admit she’s wearing a men’s fragrance they act surprised. Like it’s a scandal to wear a men’s fragrance. And don’t even start on how people react if you’re a man admitting you’re wearing a women’s fragrance. The truth is, perfumes aren’t constrained by gender. Though some perfumes can be construed as feminine or masculine. The final say on the matter always ends with the individual. If you like it–just wear it. Habit Rouge is one such fragrance where if you like it then just wear it. In Bottle: Musky citrus as the opener. After over a month of smelling safe modern fragrances, I was ready for this. Already I can detect the minor Guerlainess in the fragrance as the musk insists that I test this on. Applied: Citrus opens with a brilliant brightness. I know the version of Habit Rouge I’m smelling is not the same well-loved one that came out in 1965 but it is still a complex and extremely likable fragrance. The best part comes after the citrus as Habit Rogue morphs into a strong but not overpowering sandalwood and floral. The cinnamon in this pops in and out of the picture and continues to do this even during the dry down. The vanilla peeks in on the dry down when Habit Rogue decides that it’s time to go. Along with the vanilla something dense and leathery ushers on in as the fragrance takes a turn for the smoky vanilla and leather darkness that signals its final curtain call. Try and find a scent like this in the recent releases from mainstream houses and you may find it difficult. Habit Rogue remains beautiful even through its reformulations. 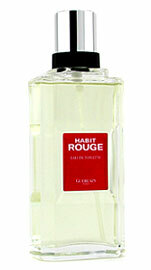 Extra: Commonly marketed and considered a men’s fragrance, Habit Rouge, to me is actually more of a unisex scent. It has a slight sweetness to it though its dry down is masculine, its opener is unisex, its heart is feminine. If you wanted a full on masculine scent, look elsewhere. If you want a beautiful unisex fragrance that’s stood the test of time, Habit Rouge it up. Design: The eau de toilette version, which is the one I tested is a very simple design. Glass rectangular bottle. Red label, metal and plastic cap. Nothing fancy, nothing over the top. I would have loved to see what the other versions were designed like but the EDT packaging was pleasant enough. No frills, no bells and whistles or gimmicks. I like it that way. Notes: Bergamot, lemon, rosewood, basil, pimento, sandal, carnation, patchouli, cedar, rose, cinnamon, vanilla, amber, moss, leather, benzoin, labdanum, olibanum . I had been chasing this one for a while, knowing that’s lovely. It’s dry down reminds me a bit of Shalimar but is a bit grittier and animalistic. It’s the leather, I think. Reviewed in This Post: Habit Rogue, 2009, Eau de Toilette. This entry was posted in classic, guerlain, oriental, Reviews By House and tagged cinnamon, classic, fragrance, guerlain, leather, oriental, perfume, rouge, scent, smoke, spice. Bookmark the permalink.